UP Police Constable Admit Card 2019.Uttar Pradesh Constable Admit Card 2019.Uttar Pradesh Police Recruitment Board (UPPRPB) 2019 Exam Admit Card.UPPRPB Police Constable Admit Card 2019 Out Now – Download Here.UPPRPB will release UP Police Constable Admit Card For 49568 Vacancies in Uttar Pradesh.Uttar Pradesh Police Recruitment Board (UPPRPB) has already declared UP Police Constable Exam Date. The UPPRPB Constable examination held on 27th Jan & 28th Jan 2019. Uttar Pradesh Police Recruitment Board(UPPRPB) invited the online application for recruitment of UP Police Constable 49568 vacant posts of Civil Police Constable & PAC. Online Application Started from 19th Nov to 8th Dec 2018. Now as you all know that the exam date of UPPRPB Police Constable also declared. 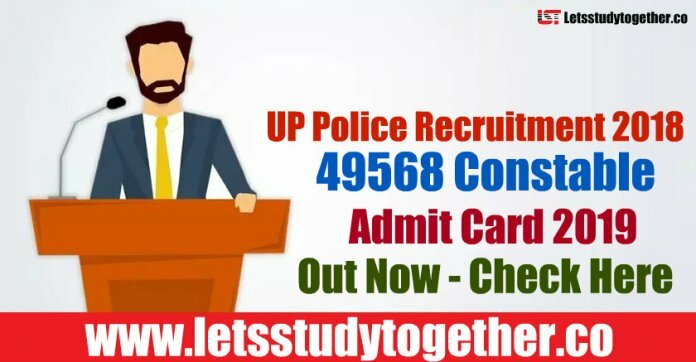 Those candidates who had successfully applied online for the UP Police Constable recruitment we want to inform them that UPPRPB is going to release the UPPRPB Police Constable Admit Card 2019/UP Police Constable 2019 soon (Before One Week). The Candidate can download his UPPRPB Police Constable Hall ticket 2019 from its official website.